This project was developed in Lagos, Nigeria with the local community of Agege. It benefited the local community by delivering a co-designed model for a technological apparatus (affordable vertical farm systems – AVF). Further research on the operational system, perception and feasibility was documented to develop a business system behind developing, building and commercializing it. For the community in general, it provided samples of environmentally sustainable building technologies available for educational purposes in deprived areas – ‘Pocket’ of green areas in typically crowded and non-green settlements. It was responsible because the prototype was not imposed on the community, rather a co-development approach where each opinion was valued was adapted, thus arousing a sense of ownership of the project within the community. The aim was to develop Affordable Vertical Farms for the People living with £1 a day. Refining the design of the 2 prototypes currently installed in Agege, adapting them to be commercially viable, and to produce food and medicinal plants. Designing the business systems to locally build, install and commercialize the prototypes. 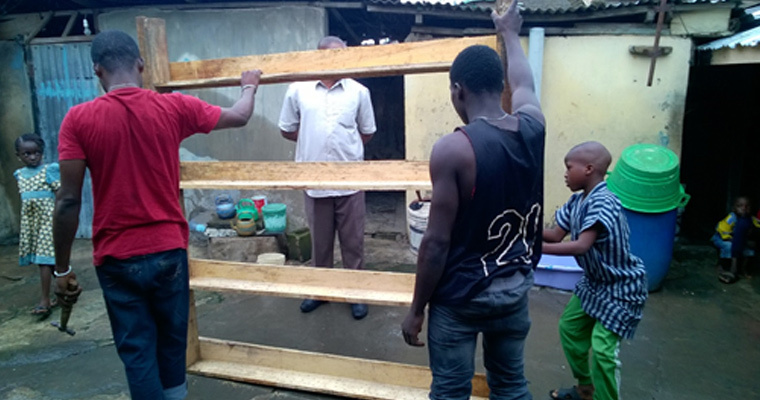 Construct and install 3 new prototypes in Agege, with local community support. Assess food growth performance and community acceptability of the prototypes. Following the participatory action approach to research with knowledge and involvement of local people pursuing a research topic influenced and outlined by local priorities, the aim was to start a new project in which the prototypes were commercially viable vertical green farms, which will produce food and medicinal plants. In this new project, The Agege community was approached to adapt their design and improve aesthetics and at the same time enable food and medicinal plants to be cultivated. To structure the business systems that will secure economic development for the community, the first step was to build business relations at the local level to secure the supply of materials, workforce, skills and knowledge of the business environment. This created a rudimentary yet functional supply chain and operational process for the early VGS prototypes. Two new prototypes were installed using the revisited design while trying to implement the proposed business model to make them commercially viable. Together with the local community we took stock of the resources and competences required to sustainably produce and install the VGSs. Based on the information and community survey conducted, a formal business plan was developed, including a more defined cost structure, resource implications, and commercial forecasts. Currently, we have employed community members to take care of the prototypes and provide updates (through photographs) on the growth rate of the plants. Who has benefited from the innovation? Low income groups, comprises of 70% of the total population ofthe22million people in Lagos, thus, it is not uncommon for them to live in blighted communities devoid of greenery. The societal challenge is to provide a pocket of green (AVF) that contributes to the health and wellbeing of the community through planting and growing medicinal plants and fresh food. The skillset that we recruited and trained to think and develop these prototypes (Carpenters, welders, horticulturist, care takers, researcher’s assistant and transportation services employed to transport materials to site. The community members who will benefit from the carefully selected medicinal plants known to improve health of its users.